In New York, every tourist has to visit Times Square. In London, Trafalgar Square and Piccadilly Circus vie for the visitor's attention. In Paris, the vacationer is expected to give at least a passing glance to the Place de la Concorde. It hasn't been corrupted by the automobile. In The Companion Guide to Venice, Hugh Honour describes the Piazza San Marco as "beautiful at all times of day or night and all seasons of the year. It is one of the few delicate works of architecture that can absorb a bustling vulgar crowd without loss of dignity; a great city square which retains a feeling of animation when there are few people in it." "The great Piazza of St. Mark's is at its very best on a hot day early in summer, when visitors from the four corners of the earth are inspecting its marvels, and Venice is one great itchy palm." "The patterned floor of the Piazza is thick with pigeons, and two or three women at little trestle stalls are invitingly rattling their packets of maize... On every step or balustrade, on the ledges around the base of the Campanile, on the supports of the two columns of the Piazzetta, around the flagstaffs, beside the little porphyry lions--wherever there is a square foot of sitting space, hundreds of young people have settled like birds, spreading their skirts and books around them." Napoleon called the Piazza San Marco "the finest drawing room in Europe." That description may have been a little off-base--there's no ceiling, and where's the sofa?--but the fact remains that St. Mark's is a far nicer place for sitting and schmoozing than the average living room or hotel lobby. What's more, the square is bordered by historic buildings and represents the focal point of Venice's water transport system. Toss in pigeons and outdoor cafés, and you've got a spot that Thomas Coryate described as "the fairest place of all the citie" in 1611--the year when the King James Bible was first published. 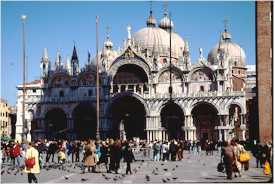 "St. Mark's Square" is a misnomer, as the accompanying photo suggests. Those slanting arcades aren't just the result of false perspective; the "square" is actually a trapezoid. Its shape, which flares outward from its enclosed end, makes the Piazza appear even more spacious when viewed from the Ala Napoleonica (the arcaded building at the top of the photograph). The piazza was laid out in the 11th Century, when its area was divided in half by a canal near the café tables in the picture. A century later, the canal was filled in, creating the basic shape that exists today. 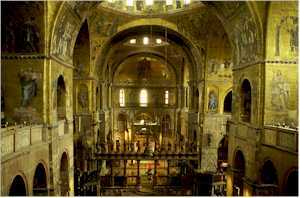 ABOVE: Interior of Basilica di San Marco. Find a spot in the middle of the Piazza and look back toward the Ala Napoleonica. The late Mr. Bonaparte had this wing built in the early 1800s to house a state ballroom. Today, the building is occupied by the Museo Correr, also known as "The Museum of the City and Civilization of Venice." Turn 90 degrees to your right, and you'll be looking at the long wing of the Procuratie Vecchie--originally occupied by the Procurators of St. Mark, the highest officials of the Venetian Republic other than the Doge. The building has been rebuilt at various times in the intervening centuries, and its ground floor is occupied by shops and other businesses. Its most famous tenant is the Caffè Quadri, where Austrian occupation troops took their Turkish coffee during the first half of the 19th Century. Rotate another quarter-turn, and you'll be facing the Basilica di San Marco: a grandiose and magnificent hodgepodge of Byzantine domes, mosaics, and plundered treasure from the Near East and Asia. Look off to the right of the Basilica for a glimpse of the Palazzo Ducale, or Doge's Palace. This Venetian Gothic edifice would be a superb Masonic Lodge if it were transferred to Omaha or Cincinnati. It looks a bit unwieldy, with its warehouse-like upper stories being supported by two layers of delicate stone arches, but it's striking nevertheless. Another slight turn, and you'll see well-heeled tourists and locals sipping drinks at the Caffè Florian, which opened for business in 1720 and has been a hangout for the likes of Byron, Balzac, and Henry James. There--you've seen St. Mark's Square, and you can move on to other sightseeing attractions or, better yet, find a table and order a glass of chilled Prosecco while other visitors take their tourist turns amid the pigeons. Note: At certain times of year, the square may be flooded for several hours at a time by acqua alta, or "high water," which is caused by a combination of high tide, low barometric pressure, and winds blowing north up the Adriatic Sea. Temporary walkways provide access to the basilica and vaporetto stops at such times. 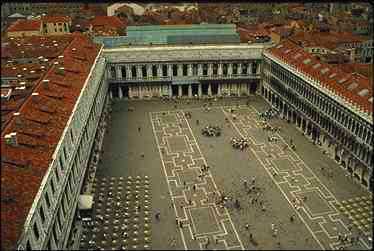 ABOVE: Piazza San Marco or St. Mark's Square, facing the Basilica. On the right is the Campanile, a brick bell tower that you can ascend by elevator. On foot: Just follow the yellow "San Marco" signs on the corners of buildings. The walk from the train station or the Piazzale Roma will take 30 minutes to an hour or more, depending on your pace and how often you zigzag off the most direct route. The No. 1 local starts at the Piazzale Roma, stopping at the railway station and a dozen other points before reaching San Marco. The No. 2 line begins at San Zaccaria , heads toward the island of San Giorgio Maggiore and down the Giudecca Canal on its way to the Tronchetto parking island, then stops at the Piazzale Roma and the train station before coming up the Grand Canal to San Marco Vallaresso. Note: Several other lines stop beyond San Marco at San Zaccaria , which is just up the waterfront from the Piazza. For detailed waterbus information, see our Vaporetto Routes article. If you're a first-time visitor to Venice, you'll probably want to stay near St. Mark's Square, the Basilica, and the Doge's Palace. Our article lists hotels on all sides of the Piazza, in every price category. Use the figures in the photo to identify the major landmarks around St. Mark's Square. Follow the numerals to find the Salute Church, the island of Giudecca, and other Venice landmarks.